If you’re a football fan (or even if you’re not), you’ve likely heard the ongoing publicity surrounding Tim Tebow. Tebow is currently the starting quarterback for the Denver Broncos and has made a name for himself with his unorthodox QB skill set and frequent display of religious devotion. 1. Prayer can turn bad into good. Tim Tebow’s mother contracted amoebic dysentry while a missionary with her husband in the Phillipines, and was treated with strong antibiotics before realizing she was pregnant. Her doctors advised her to abort, assuring her the baby would be severely disabled due to the drugs. She refused to abort because of her faith and, instead, prayed for a healthy son. Tim Tebow was born August 14, 1987, reportedly malnourished, but healthy. Nothing is too big for God. 2. There’s more than one way to reach success. Tebow has been criticized for his awkward throwing motion, his inaccuracy in passing completions, and his unorthodox method of playing. But you can’t deny his quarterback success as his team heads to the AFC Divisional Round this Saturday night. In similar fashion, stepparenting success is reached in different ways. There’s not only one way that works. Determine the techniques that will bond and strengthen relationships in your stepfamily and execute them. 3. Don’t give up, regardless of what others are saying. 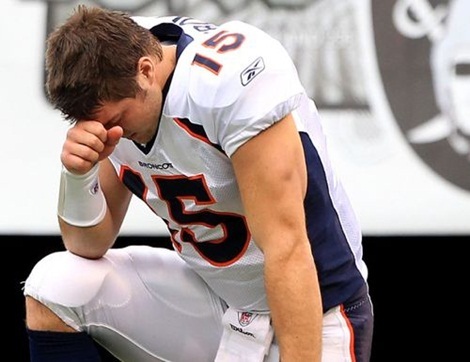 If Tebow had listened to his critics at the beginning of the season, he would have never won a football game. Instead, he continued to believe in himself and work toward his goals, despite the opposition. Stepfamilies are given a bad rap. Statistics tell us that 60% of second marriages and 73% of third marriages end in divorce. But those statistics don’t have to apply to us. Believe in yourself and your ability for long-term success in your stepparenting relationships and don’t look back. Refuse to quit even when it’s hard. Tim Tebow is not perfect but his example gives some thoughts to ponder as we relate it to stepparenting challenges.